Triplicane boasts of many historic places laced with spiritualism. Triplicane boasting the famous Marina beach, has a Railway station too … ‘Thiruvallikkeni’ station on Chennai MRTS, that opened to public in Oct 1997. The station is an elevated one built on the banks of the Buckingham Canal. It is the sixth station on the MRTS line to Velachery from Chennai beach station. Parakkum rail (not the full path though !) prior to opening of Chennai Metro was the glamorous queen; now Chennai Metro runs upto to Nehru Nagar of which upto Thirumangalam it runs underground and then on elevated track - MRTS is Chennai Mass Rapid Transit System, a state-owned subsidiary of Indian Railways, the other elevated railway line. 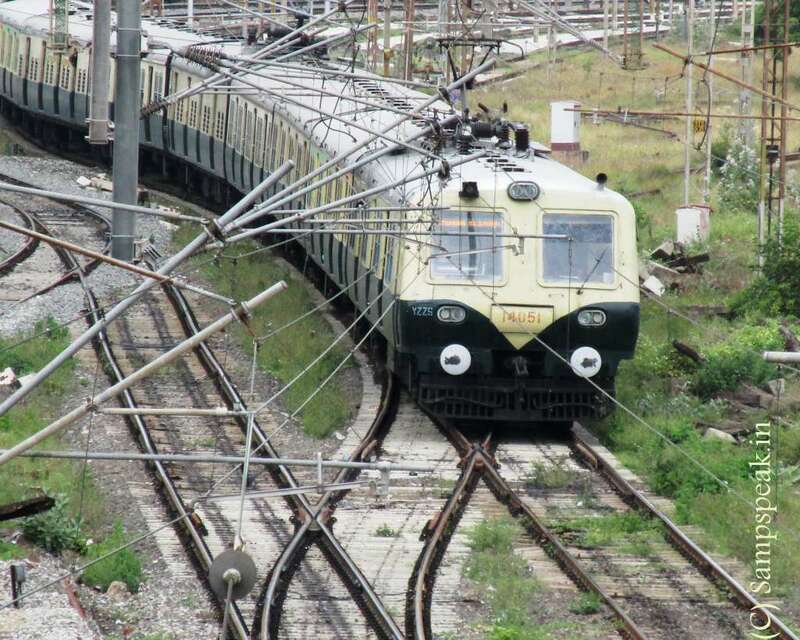 The line runs a distance of 19.34 km (12.02 mi) with 18 stations in between, from Beach to Velachery. Do you know that Indian Railways Act 1989 provides that Railway administration is liable to pay compensation for loss of life or injury to bonafide rail passengers, who become victims of untoward incidents such as terrorist acts, violent attack, robbery, dacoity, rioting, shoot-out or arson by any persons in or on any train carrying passengers, waiting hall, cloak room, reservation or booking office, platform, any place within the precincts of a railway station or the accidental falling of any passenger from a train carrying passengers. Under these Rules, the amount of compensation payable in case of death is Rs.4 lakhs. For injuries the amount varies from Rs.32,000/- to Rs.4,00,000/- depending on the nature of injury sustained.All persons who are bonfide passengers travelling on a valid ticket in a passenger carrying train as also platform ticket holders are insured under the scheme. By schedule, it would take 45 minutes for reaching Velachery from Chennai Beach and vice versa. Sometime back the trains were running late as there were sections which had to be negotiated slowly due to various works taking place. A couple of days back, Times of India, Chennai edition reported that the trains on Chennai Mass Rapid Transit System (MRTS), the city's elevated suburban railway network, between Chennai Beach and Velachery aren't late any more but are, in fact, running ahead of time. The report stated : Officials of Southern Railwayand visibly delighted passengers said — and rides by this correspondent confirmed — that rakes now make the 45-minute journey in 41 minutes. The report added that with MRTS officials imposing several speed restrictions on trains on the line to complete track renewal work, the ride earlier took up to 60 minutes.Given that the corridor connects government offices, IT parks and Chennai Central railway station, the 4 minutes that commuters save could make the difference between arriving for work early or late — with the latter possibly resulting in the docking of half-a-day's salary ! The MRTS section caters to 1.1 lakh commuters every day, with people from Arakkonam and Gummidipoondi using cross-sector services to get to localities like Chepauk and Mylapore in the heart of the city as well as neighbourhoods like Adyar and Thiruvanmiyur. Officials in the MRTS operations department said punctuality improved since the first week of April, when they completed engineering work on the section. The Railways have replaced worn-out railway tracks with new rails and installed concrete sleepers at points and crossings. They had to impose a speed limit of 15kmph and occasional halts along these lines till the work was completed. Now read this news from New Indian Express, Chennai edition - 6 years after a three-and-a-half year old boy fell into an uncovered sewage canal in a gap between the wall and floor at Kotturpuram MRTS railway station, the Madras High Court has directed Southern Railway to pay a compensation of Rs 7.1 lakh towards the boy’s medical expenses. S Srinivasan’s son fell almost 20 feet into the sewage and he was rescued after more than 5 minutes. During this time, the child’s entire body was full of sewage reportedly affecting his face, nose, mouth and almost all parts of the body. He was rushed to a private hospital nearby and treated there. Srinivasan had to pay Rs 2.1 lakh for his son’s treatment.Srinivasan filed a writ petition in February 2011 praying the court to direct the respondents to pay a compensation of Rs 15 lakh. “The contention of the railways they are not at all responsible for negligence, cannot be accepted,” a recent order by Justice S Vaidyanathan said. “Similarly, the contention of the petitioner that the entire fault is on the part of the railways, cannot also be accepted. There appears to be contributory negligence on the part of both parties. It is the duty of parents to take care of the children, more particularly when children are in the playful tender age”. However, the court said this was no ground to reject Srinivasan’s plea, especially as there was a gap between the station building and the canal retaining wall. The court directed the railways to pay a compensation of Rs five lakh and medical expenses of Rs 2.1 lakh. However, as Southern Railway had paid Srinivasan Rs one lakh by way of an interim order, it was ordered to pay the remaining medical expenses of Rs 1.1 lakh, thus amounting to a total of Rs 6.1 lakh.As Srinivasan’s son was a minor (aged three-and-a-half years at the time of filing the petition), Southern Railway was directed that Rs 3.5 lakh with interest at six per cent per annum be deposited in the name of the boy in an interest-bearing fixed deposit scheme in any one of the nationalised banks. The court ordered that the remaining amount of Rs 2.6 lakh be paid with interest at six per cent per annum to Srinivasan.